Filed to: Oil!Filed to: Oil! It will also direct Zinke to conduct a review of the locations available for offshore drilling under a five-year plan signed by Obama in November. The plan blocked new oil and gas drilling in the Atlantic and Arctic oceans. It also blocked the planned sale of new oil and gas drilling rights in the Chukchi and Beaufort seas north of Alaska, but allowed drilling to go forward in Alaska’s Cook Inlet southwest of Anchorage. 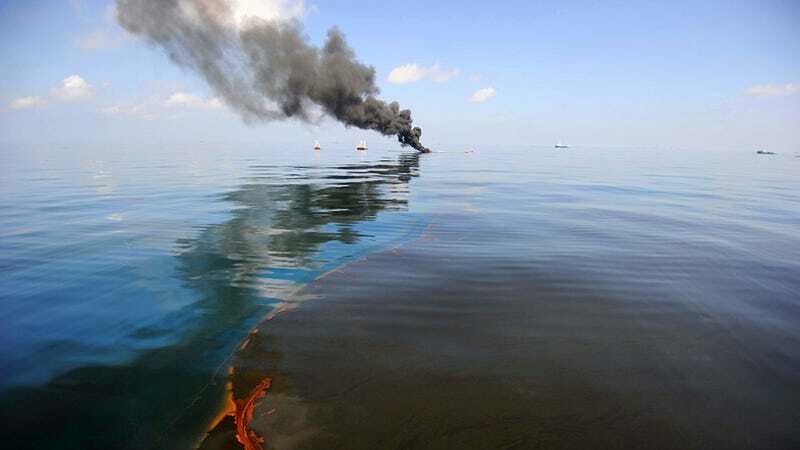 According to Interior Department estimates, the areas of the outer continental shelf that it oversees contain 90 billion barrels of undiscovered oil and 327 trillion cubic feet of undiscovered natural gas. At the moment, 94 percent of that is restricted from drilling. Along with the risk of a disastrous oil spill, offshore drilling is terrible for marine mammals that rely on sonar for navigation, hunting, communicating, and mating. The seismic tests that are necessary for scouting out new wells essentially cause whales and dolphins to go blind. Furthermore, opening up further opportunities for oil companies to keep us mired in fossil fuels will only prolong our inaction on climate change. Zinke said that concerns for the environment were “valid,” but, you know, not valid enough.